Ellora, The Temple, originally uploaded by danchitnis. Ellora is an ancient village 30 km (18.6 miles) from the city of Aurangabad in the Indian state of Maharashtra. Famous for its monumental caves, Ellora is a World Heritage Site. 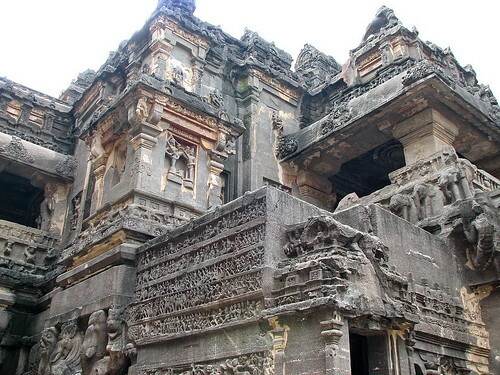 Ellora represents the epitome of Indian rock cut architecture. The 35 "caves" – actually structures excavated out of the vertical face of the Charanandri hills – comprised of Buddhist, Hindu and Jain cave temples and monasteries, were built between the 5th century and 10th century. The 12 Buddhist (caves 1-12), 17 Hindu (caves 13-29) and 5 Jain caves (caves 30-34), built in proximity, demonstrate the religious tolerance prevalent during this period of Indian history. There is no happiness for the man who does not travel. Living in the society of men, the best man becomes a sinner. For Indra is the friend of the traveler. Therefore wander!